The latest Census Bureau data show that for the second straight year, the typical U.S. household saw its income rise in inflation-adjusted terms in 2016, the last year of the Obama administration, and incomes have now recovered to approximately pre-Great Recession levels. The median U.S. household income was $59,039 in 2016, a 3.2 percent increase from real 2015 levels. While the data contain some good news, the overall story is still quite bleak. 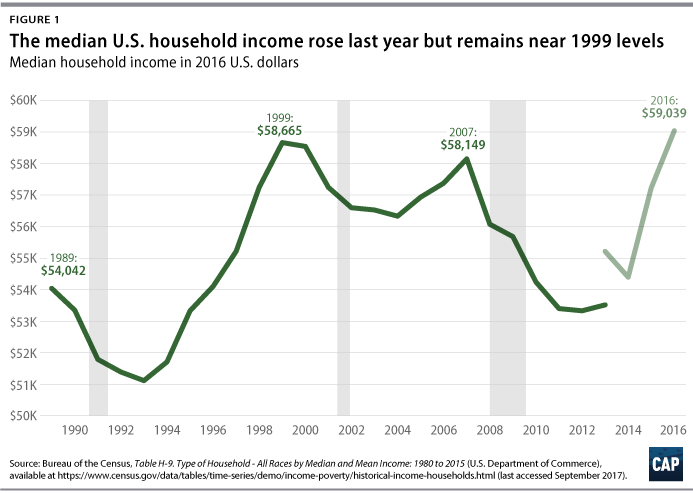 Median household income is now at roughly the same level it was in the late 1990s—meaning that household income has been effectively stagnant for two decades. Furthermore, 2016’s higher level of income when compared to years prior to 2013 could be partially driven by the survey’s redesign in 2013, which resulted in finding higher incomes than the previous survey design. It also represents a very small share of economic growth over this period. The majority of gains continue to go to those at the very top, and most households—regardless of education level or race—continue to see little income growth. In 2016, the share of the nation’s income going to the top 5 percent hit a record high, while the share going to the middle class—the middle 60 percent of households—fell to a record low. Since 1967, the first year that the Census Bureau began releasing income-share data, the middle class has never received a smaller share. On the positive side, the data show that lower-income workers have made gains in recent years and that the poverty rate has fallen dramatically postrecession, suggesting that policies such as increasing the minimum wage can make a significant impact on people’s income but that much more needs to be done. Unfortunately, the policies that the Trump administration is pursuing are unlikely to raise incomes for most Americans. The data show that lower- and middle-income households are seeing slower income growth than those on the higher end of the income spectrum. The average household in the middle 60 percent saw its income grow by 2.7 percent from 2015 to 2016, with households in the group between the 20th and 40th percentiles seeing the fastest growth. Households in the lowest-earning 20 percent saw slower income growth than in 2015, but their income still grew by 2.6 percent after another year of job growth and successful campaigns to raise state and local minimum wages. But the highest-earning households saw the largest growth, with the income of the top 5 percent of households climbing by 5.6 percent and the income of the top 20 percent climbing by 4.4 percent. This growth compounds on previous years of unequal growth. Since the end of the recession, the top 5 percent of households have seen their incomes grow more than twice as fast as the middle 60 percent, on average. Since the end of the recession, incomes of the top 20 percent have grown by 1.6 percent annually, on average, and incomes of the top 5 percent have grown by 2.3 percent on an annualized basis. Over the same time period, the incomes of the middle 60 percent grew by just 1.1 percent. 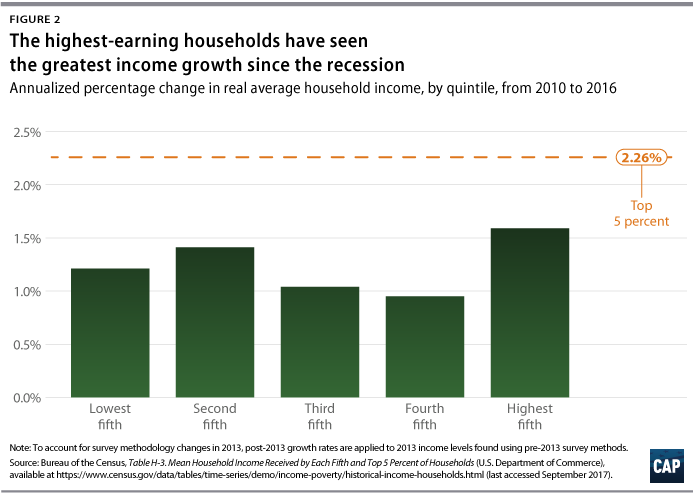 In light of this unequal growth, it is no surprise that the middle class is bringing home a record low share of income. The middle 60 percent of households earn just 45.4 percent of the total U.S. national income. The top 20 percent take home 51.5 percent, and just the top 5 percent of households earn 22.6 percent of the national income—more than the bottom 40 percent of households’ earnings combined. 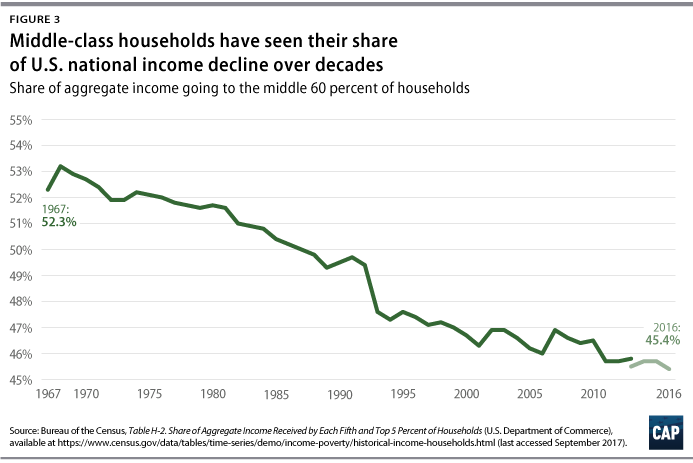 The declining middle-class share of income has a real impact on middle-class families. The average middle-class family would have earned about $10,800 more in 2016 had the middle 60 percent of households earned the same share of national income that they earned in 1968. These new data also show an economy that is not working properly for many households regardless of their educational attainment levels. 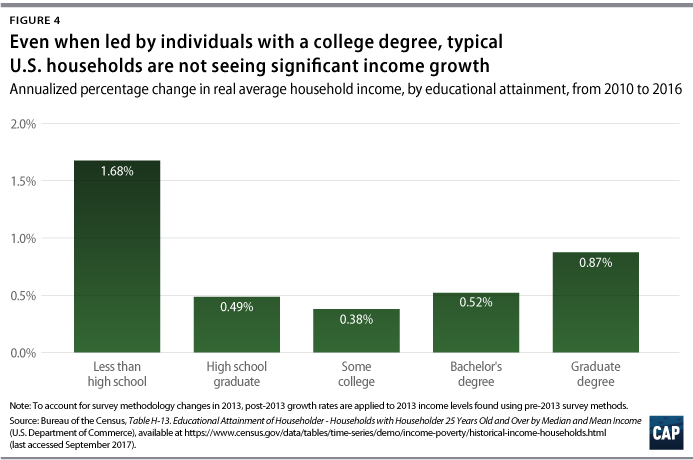 Since 2010, households headed by individuals with less than a high school diploma have actually seen the largest income growth as a share of their income, even as their average income remained relatively low at just $40,424 in 2016. This is likely due in part to the fact that individuals with less than a high school education have seen the largest reduction in their unemployment rate over the past six years, as well as due to state- and local-level minimum wage increases. Households headed by individuals with a high school diploma, some college education, or a four-year degree have seen their incomes effectively stagnate, growing at or below 0.5 percent per year, on average, from 2010 to 2016. 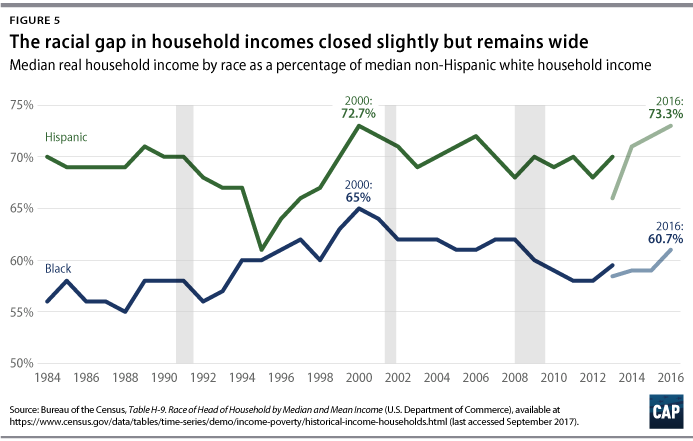 Finally, the most recent data show that incomes of black and Hispanic households remain dramatically lower than those of non-Hispanic white households. The median Hispanic household earned $47,675, 73.3 percent of the median white household income in 2016. Meanwhile, the median black household earned even less: $39,490, just 60.7 percent of the median white household income. These racial income gaps have fallen since 2015. However, the black income gap is still dramatically larger than it was in 2000. Without concrete efforts to fight the structural biases that lead to such gaps, it is possible they will stagnate in upcoming years. While middle-class families saw continued income gains in 2016, America’s economic growth is still too concentrated within its wealthiest households. This unfair economy is not a force of nature, but instead was caused by policy choices. Policymakers must take a stand firmly on the side of workers and their families to help them share in the growth that is being captured by the wealthy. 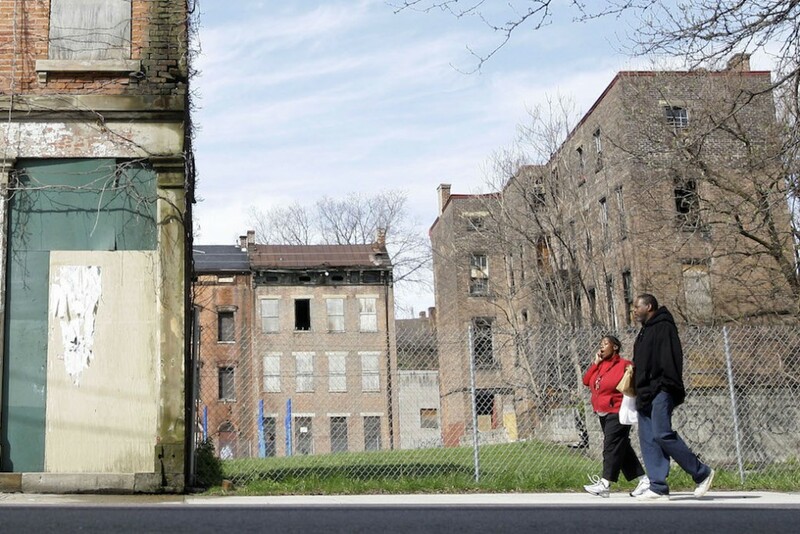 There are clear ways that policymakers could help reverse this continued growth in inequality. American workers deserve a new system of labor law that gives them greater power in the workplace and beyond, making it easier for workers to raise wages and improve benefits across an industry. Policymakers should boost working families’ economic security by improving access to child care, requiring companies to offer paid sick leave, and instituting fair scheduling requirements. The government should crack down on mergers and monopolies that hurt workers and consumers. And finally, the government should ensure that every American willing and able to work is able to find a good job, both by aiming for full employment through monetary policy and by providing a backstop of well-paying public jobs in communities across the country. Without these and similar bold policy actions, working Americans will likely face continued years of stagnant incomes. Unfortunately, President Donald Trump’s policy agenda moves in the opposite direction, with many of the policies he has pushed—from weakening overtime standards to reducing workers’ rights—set to lower workers’ pay. Alex Rowell is a research associate for Economic Policy at the Center for American Progress. David Madland is a senior fellow at the Center.